The CoPilot 256 ink jet printer is designed to print superior quality hi-resolution characters on either porous or non-porous surfaces. 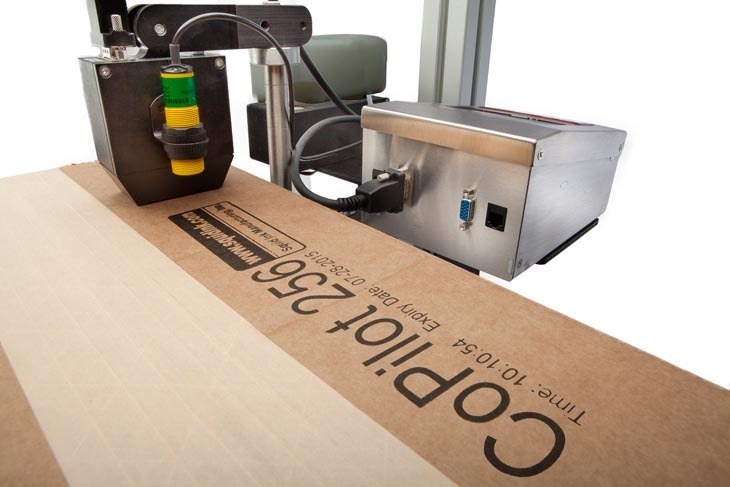 With up to 2.8” of total print height and the ability to print on both sides of the substrate in a single pass, the CoPilot 256 is designed to work as an integral part of your day-to-day packaging operation. The system is capable of running oil-based or solvent-based inks to print up to 2.8” (1.4” from a single head) of hi-resolution characters, razor-sharp text, scannable bar codes, and great looking logos at 185 dpi. For non-porous applications, users have the option of using Squid Ink’s solvent-based inks for printing on a variety of products like coated cartons, plastics, glass, shrink wrap, metals and more. Squid Ink’s PZ-1000 ink for porous substrates offers low-maintenance performance, eliminating the need for auto-priming functions and offering better ink utilization than competitive systems. CoPilot 256’s 4.3” full color touchscreen provides access to the system’s internal messages and print functions. Messages are created and edited on Squid Ink’s easy-to-use Orion™ PC Software and transferred via Ethernet or USB device. For larger applications, a virtually unlimited number of CoPilot 256 printing systems can be connected via Ethernet and controlled through one central Orion™ print station.